The fourth annual Big Dawg Dare on Saturday, July 18, was the most successful one in the event's history. With more than 600 entries, the 5K obstacle run has grown from a little dachshund to a full blown Great Dane, with dozens of community programs reaping the benefits of the organizers hard work. Volunteers from this year's Big Dawg Dare. But if all of this is true, why did I feel so lousy at Wolff Farms on Saturday. The answer is because instead of completing the Big Dawg Dare, as I did the year before, I quit. About a mile and three-quarters into the race, just before the course goes into the timber, my body had enough. For the four obstacles before I stopped, I found myself gasping for air and having to stop for two or three minutes before I was able to go on, only to stop again moments later. I tried to will myself to go on, but having done it last year and knowing what was up ahead (possibly a hindrance), I opted to make the slow walk across the course to the finish line rather than continue. I'm not entirely sure what was different this year, but it was probably a couple things. First, it was quite a bit hotter than last year and the weather may have took a little out of me. Second, the course was tougher by all accounts. Last year, I was able to do all of the obstacles, although the hay bales gave me fits. This year, the two five-foot wooden triangles in the first mile were my kryptonite and there was no getting past them. Organizer Brian Hollo gives Grace her very own Big Dawg Dare shirt. Third, and most importantly, I'm about 30 pounds heavier than when I ran last year. When we received my daughter Grace's INAD diagnosis in November, my beautiful wife Mary stopped eating. Where she left off, I picked up and I haven't slowed down much since. I never considered myself a "stress eater" but I guess when the stress is that your three-year-old may not see her 11th birthday, it's a whole new kind of situation. That's the hardest part about the whole thing for me. I could care less whether I finish first or last or whatever, but part of me felt like I let Grace down as I sat on the course gasping for air. So many people have said that Grace has inspired them to run and to do other things that they thought were impossible, why the heck couldn't I do it? Kendal Elvidge, a friend of mine, ran in a marathon earlier this year and had shirts made that said "I run for those who can't. Today I run for Grace." He gave me one and I was wearing it on Saturday. The thought went through my head that I was not only not "running" for Grace, I had quit running and thus quit on her. The fact that part of the proceeds from the race were going to the INAD research study at Washington University in honor of my little girl made it even worse. I sort of sleep walked through the next hour or so, telling people who congratulated me on finishing that they were wrong to do so. Everyone was super supportive, especially Mary, but I wasn't having any of it. I was a failure. I posted something on Facebook about not finishing, mainly to stave off any questions on how the race went and received a lot more support from those telling me it was better to have run and lost than to have never run at all. One of the comments that made the most impact came from Alexis Wernsing. "From 40 years of God-given experience, trust me Kyle Herschelman when I tell you the very best lesson and example you will teach and be for Grace is to know and trust her limitations," her post said. "Give it your best every day, but stop when your body tells you. The entire community is honored to be a part of your family, without you finishing the Big Dawg Dare." Alexis knows what she is talking about. She has overcome more adversity in her life than most people can ever dream of and her advice helped snap me out of my funk. I now have a new outlook on the race and my performance. Yes, I stumbled, but I did not fail. I will get up and I will try again. And if I stumble again, which is entirely possible, I still did not fail. As long as there is a breath in my lungs, my race is not over. 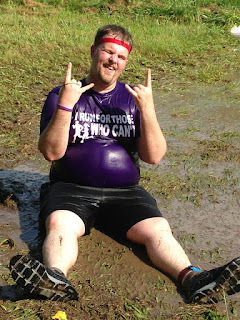 Kyle after taking the water slide at this year's Big Dawg Dare. Grace's race continues too. She has had countless setbacks, but not one has kept her from being the amazing little girl that she has become. She is my inspiration and if she can go on, so can I.
I'll see you at next year's Big Dawg Dare.